This time the spotlights are on the release called The Mediterranean Drift, another record made by a musician living by the Mediterranean Sea. The album begins with the track Losing coordinates inthe Mediterranean Drift that lasts more than 15 minutes. The first thing you hear are floating slow and viscous guitars with simultaneous rustles and clicks; this music is clearly rooted somewhere in the psychedelic genre. Ran Slavin is a phenomenal artist and an experimentalist. Every work of his is unique and impossible to imitate, he is a pioneer and a genius, as only a genius is able to play with the same component every time and still make it interesting for the audience. All six electronic/acoustic pieces are different sides of the same masterpiece. The idea of creating The Mediterranean Drift was inspired by The Shipwreck (1772), a painting by a French artist Claude-Joseph Vernet, which happens to be quite an alarming piece of art. It may very well be that not only the Mediterranean floats in the infinite ocean of space, but the entire universe itself is moving in an unknown direction; everything can go sideways at any given time and get lost in the abyss of madness. Slavin has his own unique and easily recognizable style: his music is chaotic, with the chaos of it being a real living thing, so this music is anxious and always in motion. The Mediterranean Drift is quite an anxious record as well. Paranoid motives occur throughout the entire record as hidden processes get accelerated to the maximum. 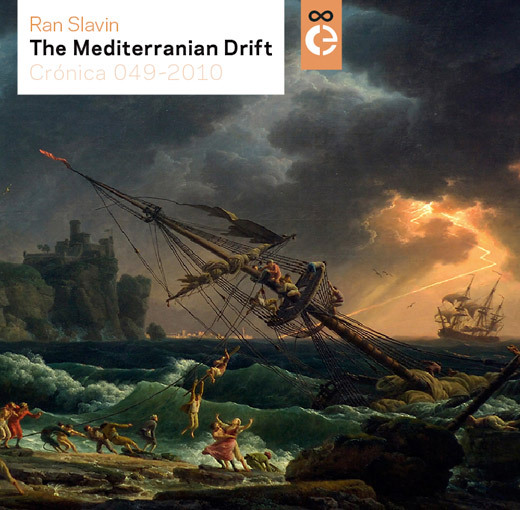 The Mediterranean Drift is available for free downloading. Enjoy! This entry was posted in Reviews and tagged 049, Ran Slavin. Bookmark the permalink. Comments are closed, but you can leave a trackback: Trackback URL.